Workshops are for beginners and improvers and cover a variety of techniques. 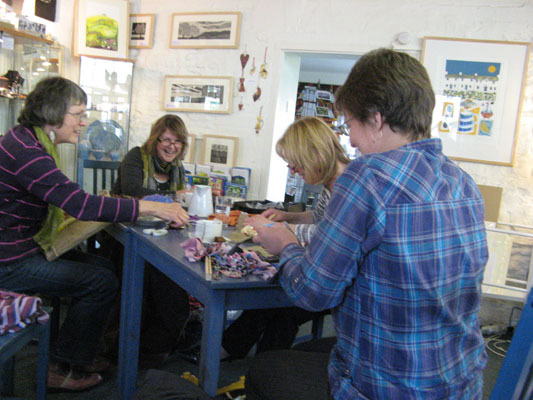 They range from one hour taster sessions to one day workshops or weekend creative breaks. What you can make depends on the time available but even taster sessions enable you to make a sample – it’s all hands on. Longer courses also cover elements involved in design in greater detail and you could complete a small project or start one to finish at home. Accompanied children are usually welcome. Some courses are just for young people or those with learning disabilities. Explore your creativity at your own pace with expert tuition. (Warning – this craft can be addictive!) Hessian, tools/equipment, books are available at courses or by mail order. Course details may be changed and new dates added later so please check with venue or email Jenni. Timothy Hawkins Gallery now at 14 Church Street, Hereford HR1 2LR. Stocked with a variety of new work, including my rag rugs. February 17 Hereford HR1 2EP, 10-4 RAG RUG WORKSHOP at Rose Tinted Rags, Hereford. April 28th HR4 0SE DAY WORKSHOP at the Pedlar’s Tray, Wyevale Garden Centre, Hereford. May 10 – 13 WR13 6NW : RHS Spring Festival at Three Counties Showground, Malvern. With Worcestershire Guild/Contemporary Craft. May 17th Worcestershire WR12 7NE , 10 – 4 : DAY WORKSHOP at the Stanton Guildhouse nr Broadway. August 9 – 12 : NEC, Birmingham The FESTIVAL OF QUILTS : The largest quilt show in Europe. Jenni’s Rag Rugs on stand QIA3. www.thefestivalofquilts.co.uk. HEREFORDSHIRE ARTS WEEK https://www.h-art.org.uk *See my work and rag rug demo on 15th at Made in the Marches Gallery, Church Street, Kington, HR5 3AZ. September 29, 30 WR13 6NW : RHS Autumn Show at Three Counties Showground, Malvern, Worcs. With Worcestershire Guild. October 20 10-4 LEOMINSTER APPLE FAIR, Herefordshire: lots of apples, craft stalls, cafe and more at the Priory Church, Church Street, Leominster. March 28 – Worcestershire WR12 7NE , 10 – 4 : DAY WORKSHOP at the Stanton Guildhouse nr Broadway. Hooking and Progging, overlooking the Vale of Evesham in a lovely stone manor house where you can see Ghandi’s spinning wheel. £60 includes yummy home cooked lunch. Info/bookings*. For optional b&b – see venue website. June 8 – Black Country Living Museum, Tipton Road, Dudley, DY1 4SQ Learn the traditional techniques of hooking and podging strips of fabric through hessian backing to make rugs, wall hangings and seat mats. August 1 – 4 : NEC, Birmingham The FESTIVAL OF QUILTS : The largest quilt show in Europe. International exhibition plus stitcher’s supplies, books, workshops, talks. Quick & Easy tasters (price includes a kit) – 3/8/19 : 9-10am Create a Flower Motif Using Two Rag Rug Techniques (Breakfast workshop £19.50); 13.00 – 14.00 Prog a Sampler – Upcycle Fabrics with Rag Rugging (£15); 4/8/19 : 11.45 – 12.45 Create a Flower Motif Using Two Rag Rug Techniques (£15); 15.30 – 16.30 Prog a Sampler – Upcycle Fabrics with Rag Rugging (£15). Show entry prices and info at: http://www.thefestivalofquilts.co.uk. September 7 – 15 HEREFORDSHIRE ARTS WEEK https://www.h-art.org.uk A nine day arts trail, for artists, craftmakers and creative businesses to open studios, galleries and group exhibitions to raise their profile and sell artwork. Well worth a visit – people come back every year to tour round studios and galleries. October 19 10-4 LEOMINSTER APPLE FAIR, Herefordshire: lots of apples, craft stalls, cafe and more at the Priory Church, Church Street, Leominster. Watch this space for details of more workshops and events.